At some point, I have to run out of new ways to cook with all the venison in my freezer…right? But not just yet, friends! I’ve discovered that for ground venison you can make just about anything that you would use any other ground meat for. Burgers, enchiladas, tacos, stuffed peppers, meatballs, etc. And then there’s venison sausage, backstrap, and tenderloins, oh my!! I knew I wanted to make a burger, and I looked around for recipes that would make a great burger with ground venison but in the end, I decided to just go with the seasonings that sounded good to me. And then there’s the sauce. Ohmahgah. A few weeks ago I made some chicken taquitos with roasted raspberry chipotle bbq sauce. Well, I had most of a bottle of that delicious roasted raspberry chipotle sauce sitting in my fridge just begging me to use it. And what better way than to mix it with some ranch dressing and slap it on a venison burger?? I’ll admit, it sounded a little weird, but something told me to go for it. J opted to have mustard on his burger instead, which I understood. But he did try a bite of mine and said it was good. I agree. It was scrumptious! I even used some of the extra sauce to dip my sweet tater fries in. Mmm! Now, for all my venison haters out there…you could use beef instead. But…for those who aren’t skeered of the buck meat…give this burger a try! In a medium bowl, combine the venison, Worcestershire and vinegar, garlic powder, salt and pepper. Use your hands to mix and evenly distribute the spices. Cover and place in the refrigerator for at least half an hour to help the flavors set in. Heat a large skillet over medium to medium-high heat. 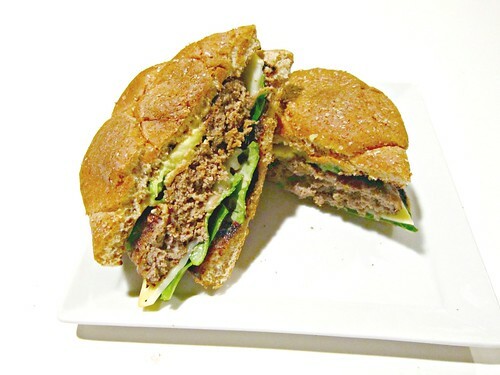 Form your meat into 4, ½-inch thick patties and sprinkle with salt and pepper. Spray the skillet with cooking spray and add the patties (do this in batches if your skillet won’t hold all four at once.) Cook for 3-4 minutes per side, or until your desired doneness is reached. Meanwhile, combine the roasted raspberry chipotle sauce and ranch dressing in a small bowl. To assemble, toast your burger buns, spread a tablespoon or so of the sauce on the bottom buns, top with lettuce, burger patty, cheese, avocado, more sauce, and the top bun.